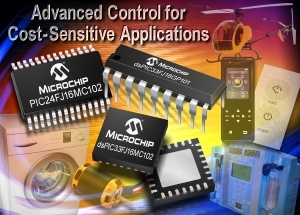 Microchip's new series of 16-bit PIC microcontrollers (MCUs) and dsPIC Digital Signal Controllers (DSCs) that bring advanced control to cost-sensitive general purpose and motor-control designs. The new devices enable low-cost, sensor-less motor control designs, with support for a wide range of motor-control algorithms, plus an on-chip Charge Time Measurement Unit (CTMU), 10-bit Analogue-to-Digital Converter (ADC) and mTouch capacitive touch sensing to enable intelligent sensor applications. The devices are supported by three new Plug-In Modules (PIMs) and a single-board Motor Control Starter Kit that includes capacitive-touch sliders and an onboard BLDC motor. This makes it easy for designers to create high-performance appliances, such as washing machines, medical products such as infusion pumps, and industrial AC-induction motors, as well as other cost-sensitive applications. With specialised features and peripherals optimised for general purpose and motor control applications, the dsPIC33FJ16 ‘GP’, dsPIC33FJ16 and PIC24FJ16 ‘MC’ devices enable designers to create higher-performing products at lower costs. general-purpose output pins, making them ideal for driving intelligent sensors. The dsPIC33FJ16 and PIC24FJ16 ‘MC’ devices include a 6-channel Pulse-Width Modulation (PWM) peripheral with synchronised outputs for 3-phase operation, enabling support for a wide range of motor-control algorithms and applications. These range from simple sensored motors, to advanced sinusoidal Field-Oriented Control (FOC), Brushless DC (BLDC), permanent magnet, and synchronous AC-Induction Motors (ACIMs), to enable designers to achieve benefits such as higher efficiency, quieter operation, smoother torque and higher reliability. To speed development using the new DSCs and MCUs, Microchip has released the Motor Control Starter Kit with mTouch Sensing (DM330015), priced at $89.99, containing a single board with a BLDC motor, capacitive-touch sliders and a built-in debugger. Plug-In-Modules (PIMs) for the dsPIC33FJ16GP102, PIC24FJ16MC102 and dsPIC33FJ16MC102 are available for use with the Explorer 16 (DM240001), which is priced at $129.99, and the $150.00 dsPICDEM™ MCLV (DM330021) development boards. The dsPIC33FJ16GP101 DSC is available in 18-pin PDIP and SOIC packages, as well as a 20-pin SSOP packages. The dsPIC33FJ16GP102 and dsPIC33FJ16MC102 DSCs, and PIC24FJ16MC102 MCU, are available in 28-pin QFN-S, SDIP, SOIC, and SSOP packages, as well as a 36-pin VLAP package. The dsPIC33FJ16MC101 DSC and PIC24FJ16MC101 MCU are available in 20-pin PDIP, SOIC and SSOP packages.